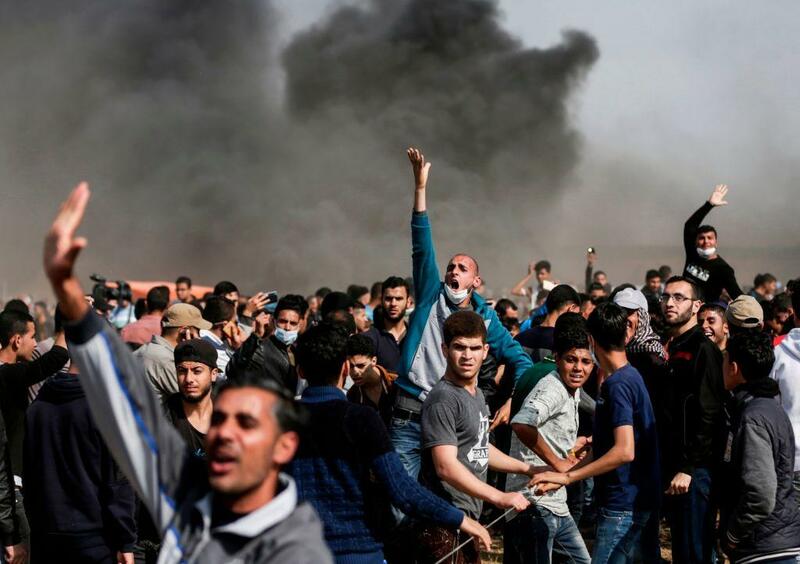 GAZA CITY, Gaza Strip -- Hundreds of Palestinians converged on the Gaza Strip's border fence with Israel on Friday, trying to rip through it before drawing heavy Israeli fire in one of the most violent incidents yet in five weeks of protests. Three Palestinians were killed and dozens were reported wounded. The violence came shortly after a top U.N. official urged Israel to refrain from using excessive force against the protesters. At least 38 protesters have been killed by Israeli live fire and more than 1,600 wounded in the weekly protests since they began March 30. Israel has rejected the international criticism, saying it is defending its sovereign border and accusing Gaza's Hamas leaders, who are organizing the protests, of using the crowds as cover to carry out attacks. In Friday's unrest, a large crowd gathered a few hundred meters from the border, with some throwing stones and setting tires on fire in what has become a weekly occurrence. Late in the afternoon, dozens of young men broke away from the larger protest, moving south about 200 meters and approaching the fence. The crowd then tried to break through the fence with hooks and wire cutters when Israeli forces opened fire. Witnesses said three protesters briefly crossed into Israel and turned around. Hundreds of additional protesters ran to the scene, and the numbers quickly grew to several thousand. Israeli armored vehicles sped to the site and fired barrages of tear gas. As gunfire erupted, the crowd dispersed. A dozen Palestinian ambulances jammed a dirt road lining up to evacuate the wounded. Some in the crowd shouted "shahid," or "martyr" as bodies were taken away on stretchers. Palestinian health officials reported three people killed and 611 wounded, including 138 hit by live fire in incidents along the border throughout the day. In a statement, the Israeli military said it had "thwarted" an attempted infiltration by Palestinian protesters. It said "hundreds of rioters" tried to burn the fence and enter the Israel. It said the crowd threw explosives, firebombs and rocks, and that troops opened fire "in accordance with the rules of engagement" and halted the crowd. It released a video showing a young Palestinian man placing a burning tire along the fence in an apparent attempt to set it on fire. In another, a small group lobs stones at an Israeli military vehicle on the other side of the fence. In other incidents, the military said Palestinian crowds rolled burning tires, hurled rocks and flew kites with flaming objects attached with the goal of damaging the fence and other Israeli targets. It also released a photo appearing to show a group of youths tugging at barbed wire along the fence. The marches, aimed in part at trying to break a decade-old border blockade, have been organized by Gaza's militant Hamas rulers but have also been driven by widespread despair in the coastal territory of 2 million people. Gaza organizers say the marches are also pressing for the "right of return" of refugees and their descendants to what is now Israel. Two-thirds of Gaza residents are descendants of refugees who fled or were expelled from properties during the war surrounding Israel's creation in 1948. The protests are to culminate on May 15, the anniversary of Israel's creation. Hamas organizers have made conflicting statements about whether they plan a mass border breach at some point. Hamas' supreme leader, Ismail Haniyeh, visited a protest camp in the southern town of Rafah, vowing larger protests in Gaza, the West Bank, Israel and among Palestinian refugees in other countries on May 15. "Our people will not slow down the protests until they get their rights," he said. The Israeli military has repeatedly said it will not allow Gazans to burst across the border. Israeli communities are located just a few hundred meters away. However, Israel has come under heavy international criticism for allegedly using excessive force. Zeid Ra'ad Al Hussein, the U.N. high commissioner for human rights, said Israeli troops have not heeded warnings by the United Nations and others, repeatedly using lethal force against unarmed protesters in the past month. Gaza health officials say that four minors, including a 14-year-old boy, have been among the dead. "The loss of life is deplorable, and the staggering number of injuries caused by live ammunition only confirms the sense that excessive force has been used against demonstrators -- not once, not twice, but repeatedly," the commissioner said. Israel's U.N. ambassador, Danny Danon, said Israel is "diligently defending its sovereignty" and accused Zeid of encouraging Hamas' "exploitation of civilians." He said the commissioner is "not focused on human rights, but only with obsessively criticizing Israel." Thousands have taken part in the Friday demonstrations from five protest tent camps, each set up several hundred meters (yards) from the border fence. Small groups usually move toward the fence, setting tires ablaze to hamper the vision of the security forces while others throw stones or firebombs. Israeli soldiers, including snipers taking cover behind sand berms, have responded by firing tear gas, rubber-coated steel pellets and live rounds. Israel's military has said troops are under orders to target "instigators," but has also warned that anyone approaching or trying to damage the fence risks his life. Israeli officials have said that some of the protesters in recent weeks tried to damage the border fence or plant explosives along it. Others have tried to set Israeli fields on fire on the other side of the fence by hurling improvised explosives or firebombs, or flying the flaming kites. A group of Palestinian activists calling themselves "the tires unit" arrived Friday on a truck laden with old tires. A van mounted with loudspeakers followed the truck with chants and applause. Tires were set ablaze, filling the air with thick smoke. With hooks and a long rope, the activists pulled at parts of the barbed wire adjacent to the fence. Israel and Egypt imposed the Gaza blockade in 2007, in response to a violent takeover of the territory by Hamas, which had won Palestinian parliament elections a year earlier. The blockade has gutted Gaza's economy, driving up unemployment and leaving two-thirds of young people without jobs. Hamas' Interior Ministry announced that Egypt had agreed to open the Rafah border crossing for three days, beginning Saturday. The temporary opening is the second this month.